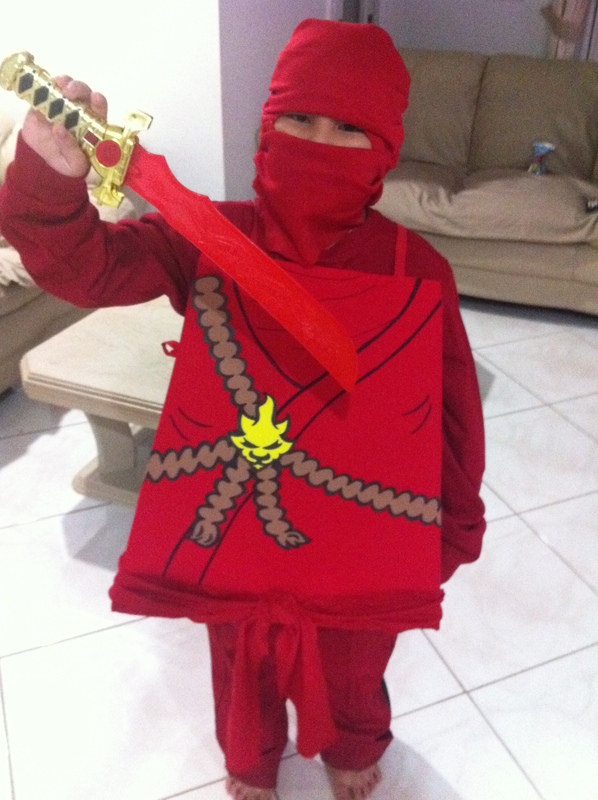 Kai Lego Ninjago Costume FINISHED! I went to look for fabric to make the top and bottom of the costume, but decided to be lazy and see if I could find any—it was my LUCKY day! I found a red long sleeve and pants at Wal-mart for less than $15! In my previous instructions, I forgot to mention to tie and glue a ninja belt on the body suit. Andy found the perfect sword from his toy box to include in his costume. He has requested that I make a slot in the back so that he can slip his sword in and out. The demands never stop! LOL. I plan to paint the eye area that shows through the mask with yellow so that it looks like a Lego character. I had the most difficult time with the mask. I tried many different “how to’s”, but it did not to look right on the head. See the wrinkles on top? I think it was because I was using a stretchy material. So then I decided to just try to old quick “make a mask out of a t-shirt” trick and it looked better. 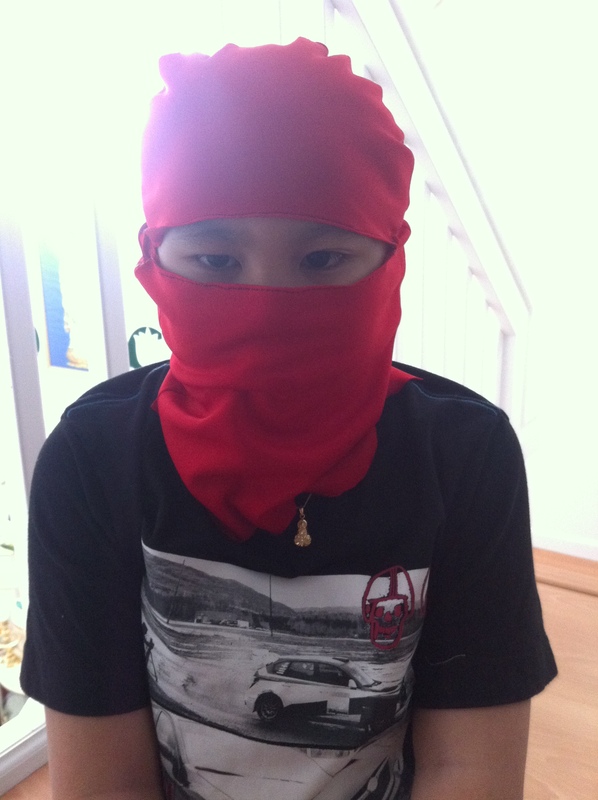 It has the layered, effect as the Ninjago masks. But I felt the t-shirt method was it was kind of heavy. And with Florida’s weather, I didn’t want Andy to drown in his sweat while trick-or-treating. So I decided to sew a t-shirt like shape (mainly the collar and sleeves, and cutting away all the excess bottom) with the lighter, breathable fabric I already had…and VOILA! I got the mask to look decent enough, LOL. 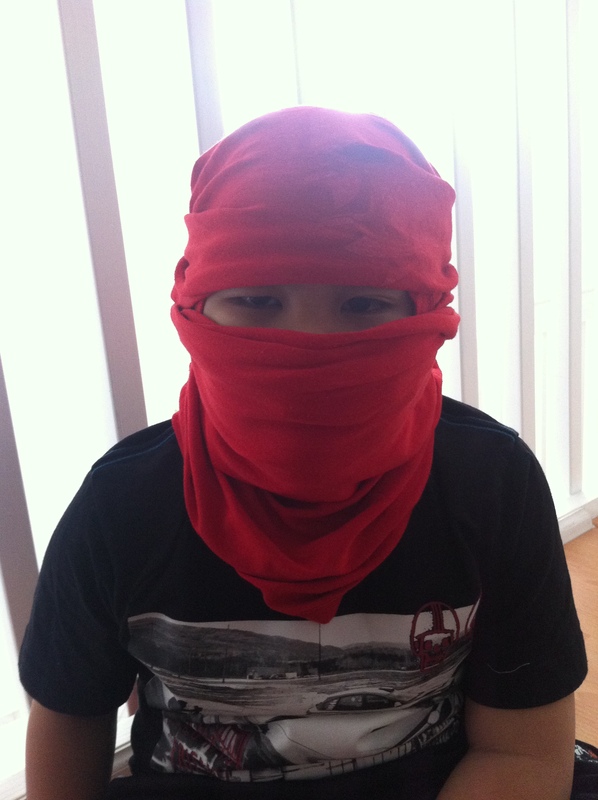 Hope you all have fun making your Ninjago costume! My brother is as happy as can be, and he says, I’m his “favorite” now. It was all worth it! For more help on making this costume, CLICK HERE. Now time to start working on my costume! We have plans to go out on Saturday and I need to finish by then. I decided to be a Ringleader, after seeing Britney Spears’ Circus music video.